Spice up your lot with these flashy pennants! 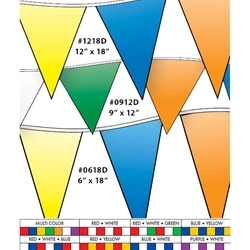 3 types of pennant sizes to choose from: 12" x 18", 9" x 12", or 6" x 18"
*Other colors are available through custom orders. Please type in your custom order in the box below.